Our list of restaurants that are open on Thanksgiving in Knoxville hasn't changed. Just click here to read the previous blog post. The good news is that a wide variety of restaurants will be open on Thanksgiving day. Eateries aren't limited to fast food. Family restaurants and even upscale dining opportunities are on the list. A couple of sports bars are also available. Shoney's, Cracker Barrel, Wasabi and others on the above list are open. There are several more. Check out the link above. 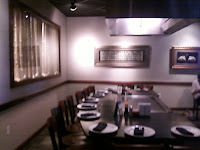 Most of the locations are offering special holiday menus or holiday selections. This adds to the festive nature of Thanksgiving. There is one thing that diners should to on Thanksgiving. If you are dining out be sure to call ahead. Even posted hours of an eatery can change. On holidays and special events diners should always phone ahead to inquire about seating and to confirm hours. Some hotels require that reservations be made well in advance. Last minute seating may not be available so please call ahead. Wherever you choose to dine we hope that your day is filled with all that Thanksgiving is.